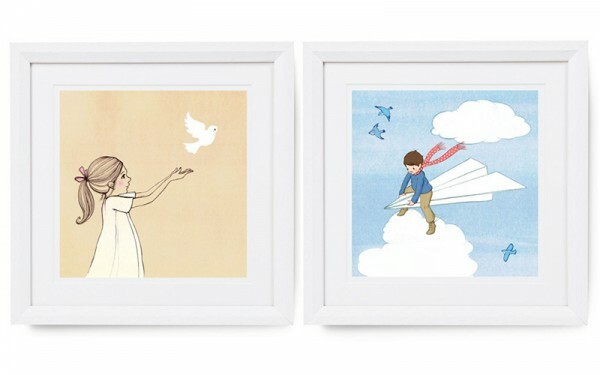 Complete your baby’s nursery or your little one’s bedroom with a beautiful piece of wall art. Or alternatively, choose an art piece and let that set the tone for the rest of the room. Whatever your taste, whatever your budget, we’ve got children’s art for you! Monochrome poster prints are always highly sought after and we adore the offerings from Swedish brand MiniWilla. The cheeky Hello Poster and fun Berg prints are images the kids will love for many years to come, priced $45, available from Mr Wolf. The Superhero poster (pictured top), that’s a little harder to come by, but if you’re quick you can get it at Pop Motif for NZ$59. If it’s beautiful pastel hues you’re looking for, Eef Lillemor is definitely worth seeking out. 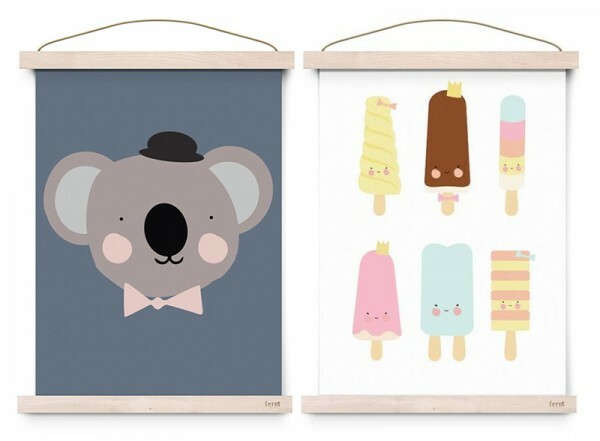 Add a touch of Australiana to the nursery with the Mr Koala Print. Naturally I choose the Ice Cream Parlour Print, it’s as sweet as can be. Available from Leo & Bella, $21.50. 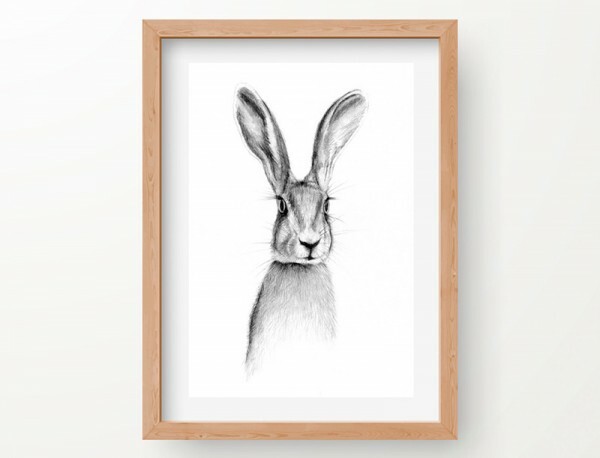 Bunnies for baby’s room is still a popular choice and I adore this rabbit art print from Etsy’s The Wild Woods, priced from $20. 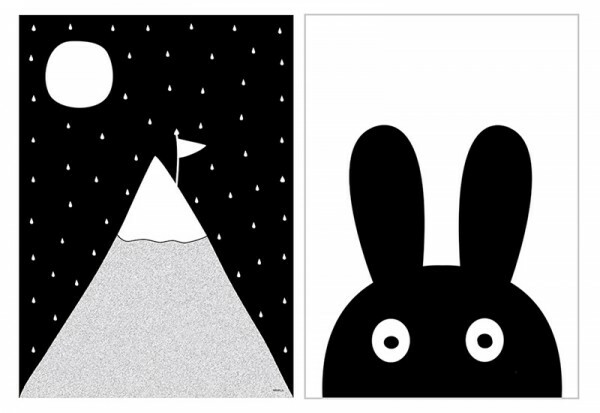 For sweet and petite artworks with a distinct whimsical vibe, Belle and Boo has an enchanting collection of smaller 25 x 25 centimetre square prints available. Our picks, Release and My Paper Plane are priced £25 each. 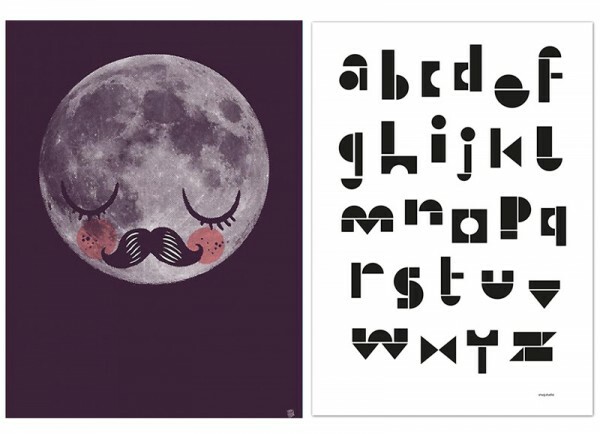 From OMM Design, the superb Moon Man Für Neil Poster, $35, is perfect for a unisex space and for building blocks enthusiasts, the Snug Studio ABC Poster, $30, is perfect. Both are available from Pip & Sox. 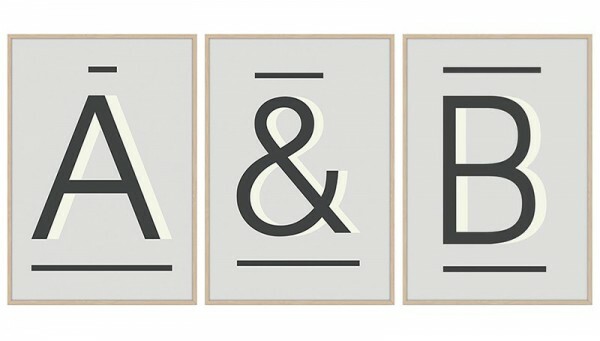 Those mad for typography will adore the One Two Tree Alpha Prints, $69, from Kidostore. 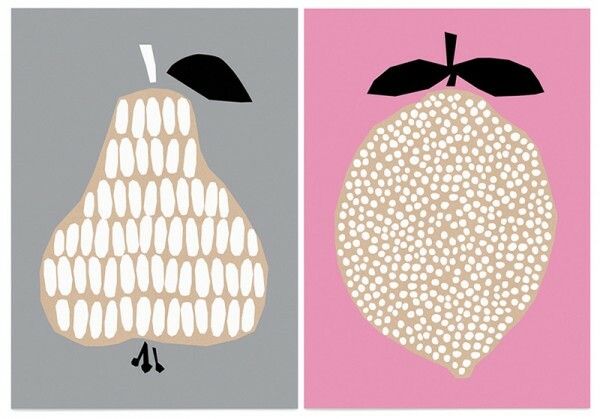 For a pair of prints that will gorgeous anywhere in your home, the Darling Clementine Harvest Lemon Print and Harvest Pear Print, both $50 from Pip & Sox get my vote! If in doubt, pick a funky slogan print. We’re loving these awesome finds from The Zoo Keeper, priced from $29 each. Laura Blythman will forever be one of my favourites for her exquisite, unique collage paper style art. 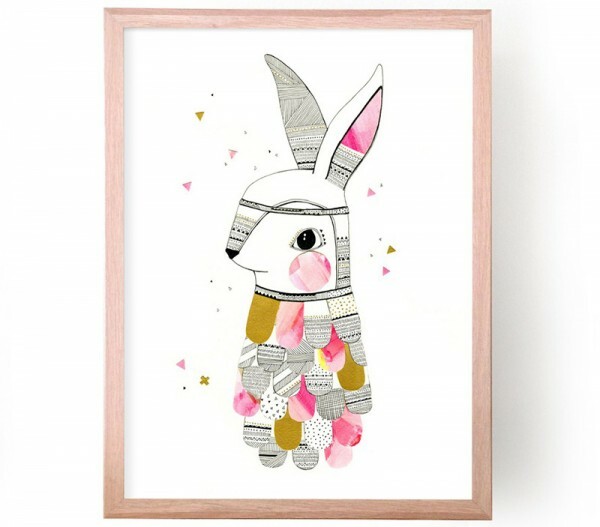 The Limited Edition Mr Feathered Rabbit print is available in pink or blue, signed and numbered from $175. 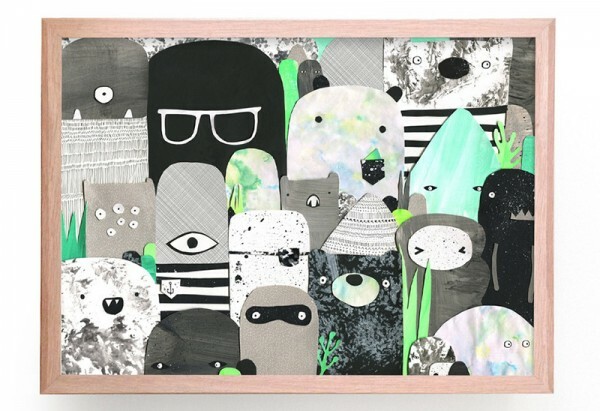 The Limited Edition Bears + Beasties print is also a fantastic find with that brilliant pop of green, priced from $175. 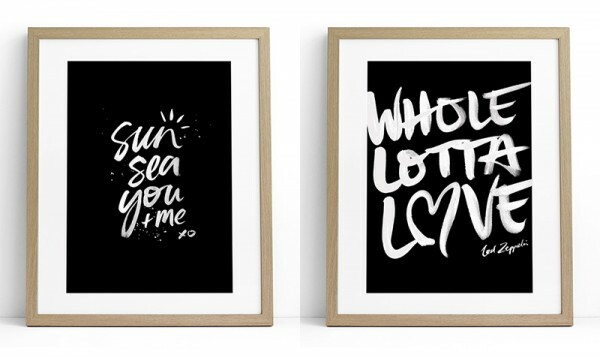 Good luck Babyologists in choosing a special print for your little one’s space. My hot tip? Find something to fit a cheap and cheerful Ikea frame to avoid expensive framing. You’re welcome.